Helsinki, The Art Museum of the Ateneum, Ars 83 Helsinki, October 1983-January 1984, no. 189. Cologne, Galerie Karsten Greve, Cy Twombly Katalog IV, January-March 1984, no. 8 (illustrated). CAPC Musee d'art contemporain de Bordeaux, Cy Twombly, May-Septebmer 1984, p. 49 (illustrated). This work will be included in the forthcoming Catalogue Raisonné of Cy Twombly Drawings being prepared by Nicola Del Roscio. Twombly's move to Italy in 1957 afforded the artist not only the extraordinary light of the Mediterranean, which is revealed here in a mix of areas of brushed gray oils with shimmering highlight and the linear agitated transparencies of calligriphy, but also access to the layered history of the region, which is the armature on which Nike Androgyne is structured. From the 1960s on, Twombly referred to mythological and historical themes and motifs from the classical world through direct and indirect references - scrawled words across a white field against which are balanced seemingly random markings, their expressively organic and off-kilter geometric shapes a palimpsest in the literal sense of marked, erased, and reused fields covered with obsessive scribbles, scratches, and swirls of pooling color. Twombly's efforts to resist, if not unlearn, traditional art school techniques and the compositional structures that would often dictate the disposition of figures or shapes on a two-dimensional plane should be understood as an effort by the artist to "de-skill," to invest in the brinksmanship of haphazardness. A lush ovoid of seemingly variegated overlaid arcs and concentric circles, moving from an outer wash of yellow, to opaque grey highlighted with white, and on to an aquamarine blue enfolds a small area of flesh-toned pigment embedded in the central vortex. This sensuous chromatic coil is overlaid with erratic lines of purple, brown, and blue linear pirouettes and undulating arches in crayon. Sprouting upward and out through the bands of colored whorls, a grey tubular column terminates in a flash of red and yellow that unleashes an upsurge of swirling, decompressed matter. The dynamic centripetal movement of chroma is contrasted with the spare hand-written inscription against a white, raw ground. "Haphazardness goes along with writing. Writing was his way of getting poetry into pictures, which he very much wanted to do - especially poetry filled with elegiac regret" (T. J. Clark, "At Dulwich," London Review of Books, August 15, 2011). Twombly's seemingly random shapes often summon textual referents, and Nike Androgyne is no exception. From the mid-fifties, Twombly expanded his markings to include a graphic dimension, eliciting relationships between language and form. Nike Androgyne is one of a large group of fifteen drawings executed in Bassano, in Teverina, in a house Twombly converted to a studio. 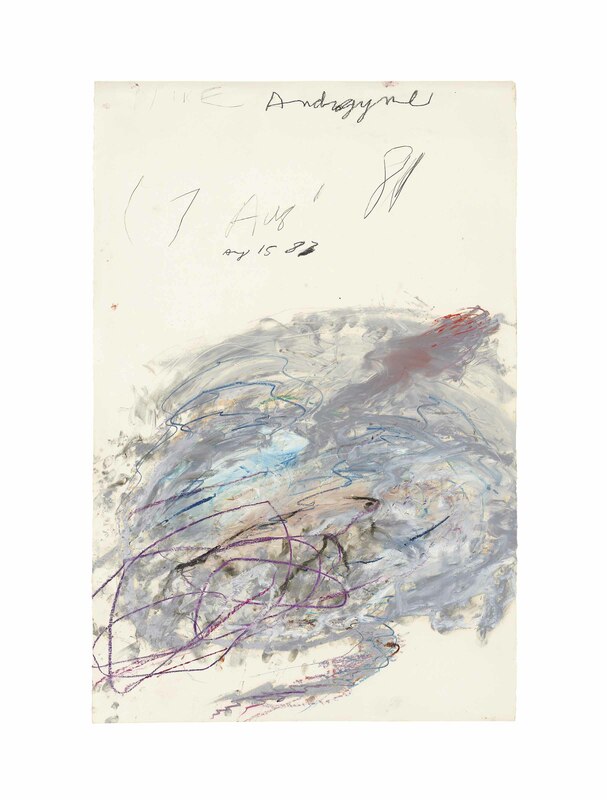 In August 1981, Twombly began the present work and another related drawing, which was expanded then into a larger series over a two-year period, the Anabisis. The entire group of fifteen drawings is based on the history related by the fourth-century BC historian Xenophon. Xenophon was a professional Greek soldier who under Cyrus the Younger, marched with the celebrated "ten thousand" in a disastrous attempt to seize the throne of Persia from his brother, Artaxerses. The Greek word anabasis means a literal march inland from the sea. Descriptions by Xenophon of the chariot, the primary motif Twombly depicted throughout the Anabasis series, is described first in Book II, where Cyrus, wearing a helmet, purple tunic, and carrying a shield inspects the soldiers he has amassed. Twombly's motif in the present work conjures the scythed-chariot, described by Xenophon in Book VII, Section 8: "And all along their front was a line of chariots at considerable intervals from one another - the famous scythe-chariots, as they were named - having their scythes fitted to the axle-trees and stretching out slantwise, while others protruded under the chariot-seats, facing the ground, so as to cut through all they encountered. The design was to let them dash full speed into the ranks of the Hellenes and cut them through" (Xenophon, Anabasis, or March Up Country, Book VIII, trans. H. G. Dakyns, New York, 1897, Gutenberg Project). Twombly suggested such savagely destructive protrusions, where manic looping and scribbles depict the wheel/chariot, often countered by horizontal scratches, which bear extensions forming the scythes jutting from its top and bottom. The progress from a more literal to a more schematic version can be traced throughout the series, culminating in what can only be considered the present work's more powerful expression of roiling violence and dynamic effacement. Could it be that Twombly's graffiti-like accumulations of markings characterize the forward thrust of soldiers amid the chaos of violent clashes as Cyrus falls in battle? Xenophon's evocative description follows here: "But with the forward movement a certain portion of the line curved onwards in advance, with wave-like sinuosity, and the portion left behind quickened to a run; and simultaneously a thrilling cry burst from all lips, like that in honour of the war-god--eleleu! eleleu!" (Ibid.). One senses that the artist's movements are compulsive, building through alternating spurts of action and repose the physical traces of the hand and body movements that went into the formation of the image. Twombly creates an expressive scaffolding consisting of literary references, the handwritten quotation, and an allover formal calligraphic tableau, from which an ancient story might be inferred, yet which is programmatically linked within a single system of physical markings whose traces can be interpreted as deliberate or suggestive analogies to the classical heritage of the Mediterranean. Nike Androgyne demonstrates Twombly's expressive gesture toward Mediterranean historical culture and to his own artistic practice. Yet even more, it is a brilliant example of the trace of sensation and experience. "Most painting defines the image. It is at this point that I break with the more general process of painting. Each line is now the actual experience with its own innate history. It does not illustrate, it is the sensation of its own realization. The imagery is one of private indulgences, rather than an abstract totality of visual perception" (C. Twombly, "Sign," Esperienza Moderna, no. 2, 1957, in L. Norden, "What Painting Can Contain," exh. cat., Cy Twombly: A Gathering of Time, Six Paintings and a Sculpture, New York, 2003, p. 16).